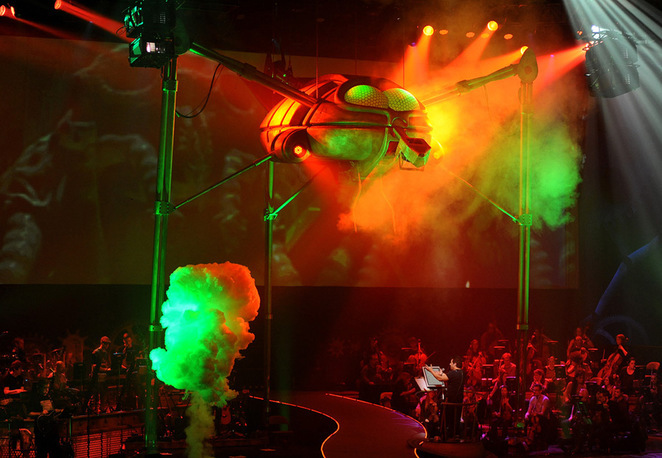 It may be billed as the final arena tour for the musical version of The War of the Worlds, but speaking to me from his English home, musical creator Jeff Wayne assures me this isn't the last fans have seen of the famous theatrical spectacular. Although he can't reveal all the details, he does say that there will be an exciting announcement in early 2015. From his suggestions, it seems the show will be developed in a very different, innovative way. Until then, this final arena stage tour sees X Factor winner Shayne Ward play the Artilleryman alongside Jason Donovan (as Parson Nathaniel), Westlife's Brian McFadden (The Sung Thoughts of The Journalist) , Carrie Hope Fletcher (Parson Nathaniel's wife, Beth) and another X Factor star Joseph Whelan (The Voice of Humanity). Hollywood actor Liam Neeson also appears in the show in the form of a 3D hollogram. But an added touch of excitement for this final War of the Worlds tour is that it will feature the voice and image of the story's author HG Wells in three scenes. Jeff Wayne, who conducts the nine-piece Black Smoke Band and 36-piece orchestra of strings in the performance, says: "For our final UK arena tour, I decided that it was time to give its creator, HG Wells, a chance to 'have his say', about why he wrote what has become known as the first science fiction story ever written, and its meaning to the real world we live in. As a result, HG Wells will be seen and heard aged 33, 53 and 79." Described as one of the most ground-breaking arena tours of all time, the show has built up a large group of fans and Jeff Wayne gives hope to those people when he tells me that there is much more in the pipeline. "I am excited that once this tour is over, I'll be announcing a new direction for War of the Worlds," says Wayne. "It's something that I have never done before and gives it a life thereafter. It's the right time to put my energies into it. "All I can say at the moment is that it will have lots of new ingredients. It's not the end of the War of the Worlds if what we do next succeeds." The science fiction story about Earth being invaded by Martians was written by HG Wells in 1897 as a serialised adventure for Pearson's Magazine in the UK and the US's Cosmopolitan magazine. It proved so popular that a publisher asked the author to "glue" the episodes together and issue it as a book. Jeff Wayne adapted the story into a musical version in the 1970s and has never looked back. Wayne said: "Although it was a dark, Victorian tale, I've had many people say to me that they can relate to it because of the descriptions in the book. This story has resonated with every generation because it's an invasion story. "Every generation has those issues, whether it's one nation fighting another or a superstate in charge of a nation. Even with the Roman story of Sparticus, it's about the masters ruling over the slaves like an alien force. "Fighting martians has become a big part of my life.There's a loyal following that stay with me but I know that if I make a change that isn't liked, I'll get it in the ear through the internet forum posts. I know very quickly, but that's also satisfying. "I fell in love with that dark Victorian tale and I've tried to stay very true to it." Tickets cost from £38.50. Visit the Tour website for details and to book or the ticket website. Tickets for the LG Arena date are priced at £49 & £72.85 from the Ticketfactory website or by calling 0844 338 8000.